Pan Pacific Nirwana Bali celebrates their opening with a special introductory offer. From now till 30 June 2010, guests can book a Garden View Deluxe room for USD135++ per night. Rooms in this category overlook the resort’s award-winning Greg Norman golf course. 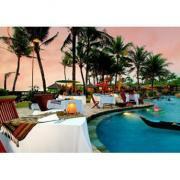 Located on the southwestern coast of Bali, the 278-room resort is 45 minutes away from the international airport. It enjoys a stunning view of volcanic landscapes and the Indian Ocean. As part of this offer, guests are guaranteed an extended check-out until 3pm. You can also choose any two complimentary options from the following: an upgrade to the next room category, broadband Internet access or daily breakfast for two. Dining options at the resort range from Western to Asian and Mediterranean. The Nirwana Spa offers holistic Balinese treatments, while Balinese dance classes are available along with an extensive list of sports and recreational activities. Call (62) 361-815-900 or visit www.panpacific.com/bali for reservations.